Turtle excluder nets have saved many sea turtles. Watch to learn what an excluder net is and and how it works! When fishers put out their trawl nets in the Gulf of Mexico and South Atlantic, sea turtles often end up trapped in the nets unintentionally. If the turtles cannot escape, they will drown. This is a major threat to marine turtles and it is known as bycatch. In the 1980s and 1990s, NOAA and the shrimp industry developed turtle excluder devices. These devices direct turtles toward an opening in the shrimp net, so they can escape. Each year NOAA tests new and improved turtle excluder device designs in Panama City, Florida, using loggerhead turtles raised in its Galveston, Texas, lab. The required use of turtle excluder devices has resulted in an almost 100% reduction in turtle deaths due to shrimp nets. 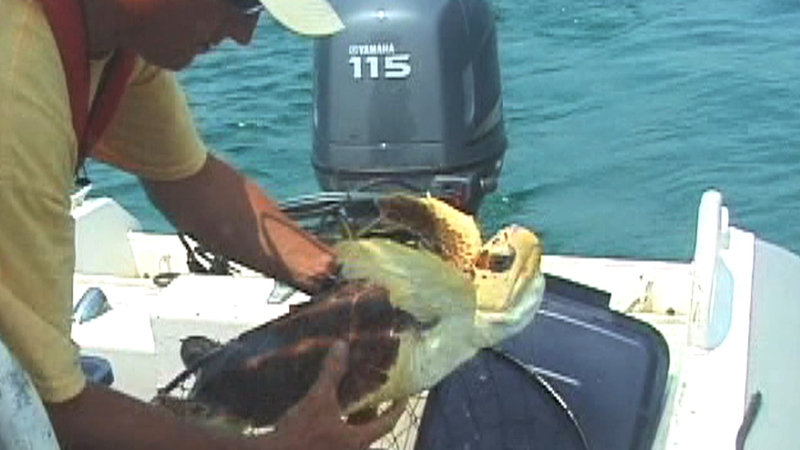 NOAA continues to work with fishing industries all around the world to develop new techniques for preventing turtle bycatch and promoting sustainable fishing operations. One of the major threats to sea turtles in the marine environment is bycatch, injury, and mortality during fishing operations. A "Turtle Excluder Device" is a grid of bars with an opening either at the top or the bottom of the trawl net. The grid is fitted into the neck of a shrimp trawl. Since 2007, nearly 1,500 comparative tows have been conducted aboard commercial skimmer trawl vessels in NC, AL, MS, and LA.